Includes a game editor for adding or editing game content. The latest patch is Patch 1.06 for international versions and Patch 1.061 for Russian versions. Some retail re-releases already include the latest patch (the version is shown on the title screen). 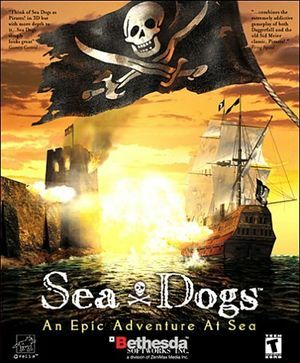 Apply the Sea Dogs intro skip. Vert- with stretched UI; see Widescreen resolution. Sea Dogs is Vert-; FOV is always the same. 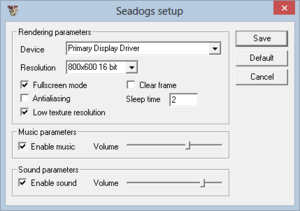 Use reduced color mode or set desktop to 16-bit color to fix windowed color issues. On/off only; if it doesn't work or you want a higher setting, force it in the video card control panel. Change WINDOW_WIDTH and WINDOW_HEIGHT to the width and height of your resolution. Menus and other interface elements will be stretched, but 3D elements will have the correct aspect ratio. Most dialogue is text-only but cutscenes and voices have no subtitles. The retail version may have invisible text in certain situations (such as when running on Windows 10) due to a font issue. Replace all instances of log-russ, log-russ-Italic, and seawolf with arial (or another working font). All in-game text will be readable but will not have the correct appearance due to the different font. You have set a resolution your monitor does not support. 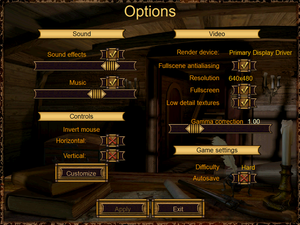 Edit engine.ini and enter a supported resolution (see Widescreen resolution). 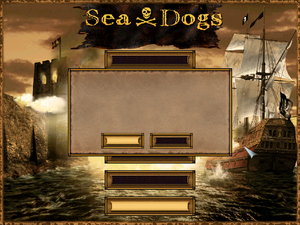 Sea Dogs includes a hidden editor that can be used to add or edit quests, equipment, characters, etc. Choosing Game from the Tools Launcher will return to the game and reset this change. Repeat to re-enable. ↑ 2.0 2.1 File/folder structure within this directory reflects the path(s) listed for Windows and/or Steam game data (use Wine regedit to access Windows registry paths). Games with Steam Cloud support may store data in ~/.steam/steam/userdata/<user-id>/764670/ in addition to or instead of this directory. The app ID (764670) may differ in some cases. Treat backslashes as forward slashes. See the glossary page for details. This page was last edited on 8 April 2019, at 11:28.